Croatia international Mateo Kovacic is reportedly keen on staying put with Chelsea on a permanent basis after becoming an integral part of Maurizio Sarri's plans this term. The 24-year-old joined the Blues from Real Madrid on a season-long loan last summer and he has since managed 44 appearances for the west London side across all competitions. 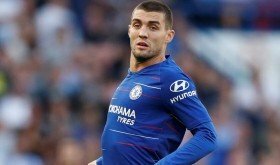 According to Goal.com, Los Blancos are likely to sanction the midfielder's exit in the summer and Kovacic is said to hold the preference of joining the Blues on a permanent role. Still, the transfer remains complicated with the Blues' two-window transfer ban and the club may decide on his future only if they are able to freeze the embargo for the summer at the least. Chelsea bagged a second straight Premier League victory on Wednesday night where they overcame Brighton & Hove Albion by a comfortable 3-0 scoreline at Stamford Bridge. They are now within goal difference off fourth-placed Arsenal but their cross-town rivals have the advantage of a game in hand. Sarri's side are scheduled to host West Ham United in their next match on Monday night.